The holiday season is a great time to show your clients and employees how much you appreciate them, and what better way to do that than with a gift? Holiday gifts express appreciation, and show the recipient how much they are valued. As a result, they are likely to maintain a positive perception of your company. ASI’s 2017 annual corporate gift-giving report found that companies spend on average $46 per gift for their clients and $79 for their employees. There is no right or wrong amount to spend, but remember, ideally, the money spent on holiday gifts will be reciprocated through future sales, repeat business, and employee retention. You should focus on purchasing gift items that will optimize your budget and positively impact its recipients. If you have a lot to spend, we suggest getting multiple useful gifts and including one high quality item that may be pricier than the rest. If your budget is on the lower side, you may decide to gift one item that is more expensive, yet meaningful. Think about the needs of your recipients when choosing the contents of your holiday gift--what might they need, or find useful? The end-goal is to express your appreciation, impress them, and show them that they made the right choice by choosing you. In order to achieve your goal, you have to decide on a gift that they will likely appreciate. Consider their likes, interests, and current trends. A gift created with the recipient in mind is sure to make a lasting impression. Gift items that are unique and memorable are more likely to resonate with the recipient. Your creative gift will lead clients to associate your work with that creativity and form a favorable opinion of your business. By putting this extra thought and effort into creativity, your clients will know you are serious and dedicated to working with them in the future, and your employees will know how much you appreciate them and all their hard work. Just as creativity reflects your business, so does presentation. You’ll want to present your holiday gift in an organized and attractive fashion. Make the packaging decorative and pleasing to the eye. That way, your recipients are excited and curious to see what’s inside. Make sure it is easy to open, and protects the contents inside. You should also make an effort to include all types of holidays celebrated, and refrain from a theme that associates with one specific holiday. Additionally, now is not the time to be super promotional. We recommend incorporating your logo or brand in some way, but make it subtle. That way, your gift doesn't feel like a promotional piece but the recipient will always associate your gift with your brand. 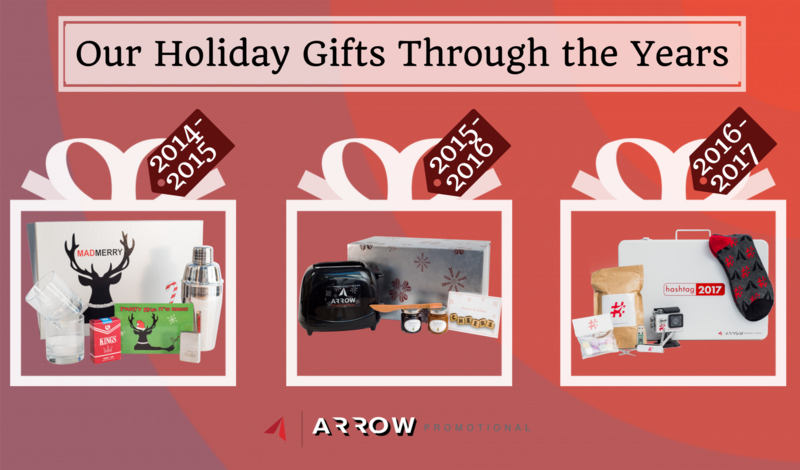 Take a look at the last few holiday gifts Arrow Promotional created for our clients! Arrow takes a lot of pride in our holiday gifts. We can help you with your next one! Arrow Promotional is the best source for branded items, and we’ll help you choose holiday gift products that will blow your clients and employees away this season. Contact us to find out more!